This was Grandma's birthday present to Grace. If you could be a fly on our wall, on many hot afternoons when Daddy comes home, you will find us all holed up in our bedroom, the only room with an air conditioner. Mom reads from the Narnia books, and the rest of the family engages in what has become somewhat of a Family Obsession. Daddy is the Master Designer. 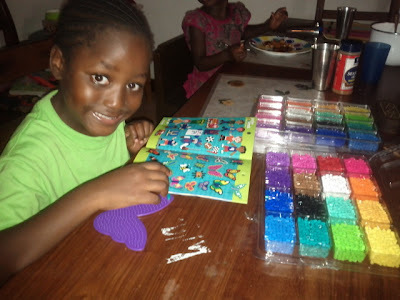 And Grace has always been one who would do crafts all day, every day, if we let her. But this little guy has given us the biggest surprise. This is the five-year-old who just developed the small motor skills to write his name a couple of months ago. 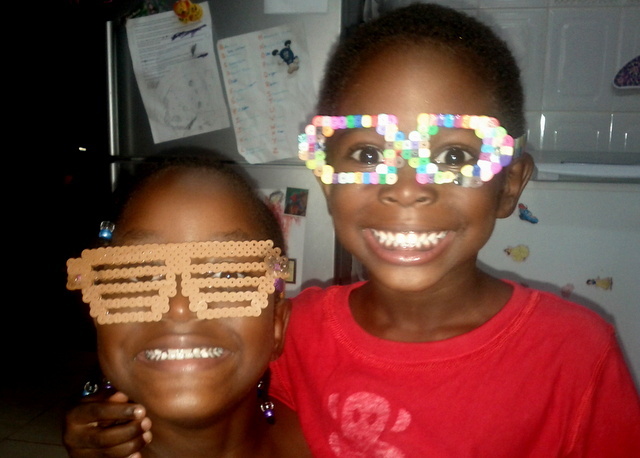 The one who hates coloring and drawing, and school work only comes along with a great deal of bribery encouragement. The one with energy coming out of every pore of his body. Focus and concentration have never been his strengths. But somehow these silly little beads have captured his imagination. And so he sits, every day, for hours at a time, creating. And as every parent knows, you're happy with whatever you can get. Right? This is really only a small fraction of what has been created in the past month. The rest have been given to poor, unsuspecting friends who have to pretend that they are just so excited to receive one of these plastic creations. Good thing we have nice friends. I lay in bed last night, trying to sleep in a sauna. Praying for breeze to come through the windows, and fretting over the meat in my freezer which was slowly defrosting. I actually think the chicken kept me awake more than the heat. The transformer in our neighborhood had exploded, leaving us without power for about 40 hours. Our back-up battery system only lasts about 8 hours before needing to be re-charged, and our generator was letting out an awful lot of smoke, so we were left with the sauna. Thankfully, it was only 40 hours, and not six days like the last time a transformer exploded. And we did eat the chicken and nobody threw up. We're going back to California in July. I'm tracking plane ticket prices online. We're staying for a year this time, which means that I'm buying one-way tickets. For the first time in 8 years, we will rent an apartment in the States. So I've been thinking a lot a lot a lot about America these days. During those times when I lay in bed sweating, I especially think about America, The Land of Eternal Electricity. I admit it; I like comfort. Oh yes, do I like comfort. I don't like being overly hot and I definitely don't like being sweaty. I like drive-throughs and superstores and I like entertainment. I like good health care and roads where people follow the rules. I'm looking forward to speaking English wherever I go. I'm excited about Trader Joe's and clothes dryers and real customer service. I will be relieved to blend in with the crowd instead of being the sore thumb all the time. Why do I choose this life in Tanzania? Why don't I just get on that plane in July and never come back? Because God has taught me that comfort does not equal contentment. In fact, it's often the uncomfortable that teaches me to be content with the comfortable. Like a mom who never learned to appreciate a good night's sleep or time to herself until she had a baby. Like a cancer patient who never learned to appreciate health until she went through hell and back. Electricity, water, infrastructure of all kinds, medical care, and purposeful work have all gained new meaning by living in Tanzania. It's kind of funny, actually, because after 10 years, this has, in many ways, become my comfortable life. Moving back to Southern California with its social expectations and pressure to look perfect and consumerism.....that's scary to me now. I will be lost. But the more I am lost, the more I will find. The more I lose, the more I will gain. The less I am comfortable, the more I will find real contentment. She wanted to invite all the kids in her class. So since nineteen exceeds the number of children that Mommy is comfortable having in her house at one time, we held the party at HOPAC (there are no parks in Dar es Salaam). It was easy as pie. The kids brought their bikes and scooters; then we gave them a hose and they turned the playground slide into a water slide. Bikes, mud, and chocolate cake. Pretty much all you need when you are Seven. When my kids grow up, if the best that people can say about them is that they are really, really nice, I will be sorely disappointed. Yeah, okay, so I'll be relieved that they didn't choose a life of drugs; I'll be glad if Josiah actually avoids a criminal record, and it would be nice to know that they are hard-working, productive citizens. Because a person can be really, really nice and be a hard-working, productive citizen, and still live an absolutely meaningless life. My dream for my kids is that they will live a crazy, bold, risk-taking, culture-changing, selfless lives...for Jesus Christ. I pray that they won't be afraid to sneak into a country that is closed to Christians. I pray that they will be willing to risk their lives for the gospel. That they will rather go to prison than compromise what they believe. I pray that they will desire to get dirty, sacrifice comfort, and love the glory of God more than the praise of men. I pray this for HOPAC students too. And it's a tall order, I know. Not exactly something I can control in the lives of our students, or even my own kids. Really, it's up to the Holy Spirit to light that fire. But I can certainly pack in the kindling. 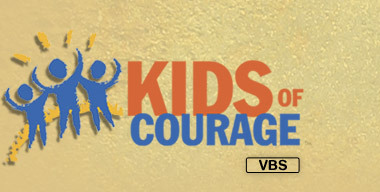 Which is why I am teaching Voice of the Martyr's Kids of Courage Curriculum in elementary chapel this semester. It's written for a VBS, but it's easily adaptable for other settings. 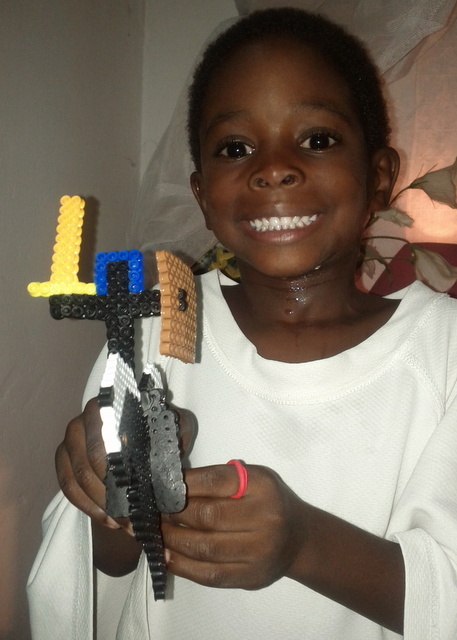 It focuses on five countries where Christians are persecuted, written on a kid's level. Yesterday morning, I taught on North Korea. In later weeks, I will go through Nigeria, India, China, and Egypt. It's not pretty to teach kids about suffering around the world. Not all the stories have happy endings, and they are full of hunger, pain, and lostness. But strength, perseverance, courage, and of course, joy, permeate the lives of these believers. And that's what I want for my kids. Tanzania recently turned up as #24 on the list of countries with the most Christian persecution. America is not on that list, but yet, it's pretty obvious that's where we are headed. Lines are being drawn in the sand. Are our kids strong enough to stand their ground? Quick, Gil, get out your phone and take a picture! Do you think the police will accept this reasoning as legitimate when they pull this guy over? 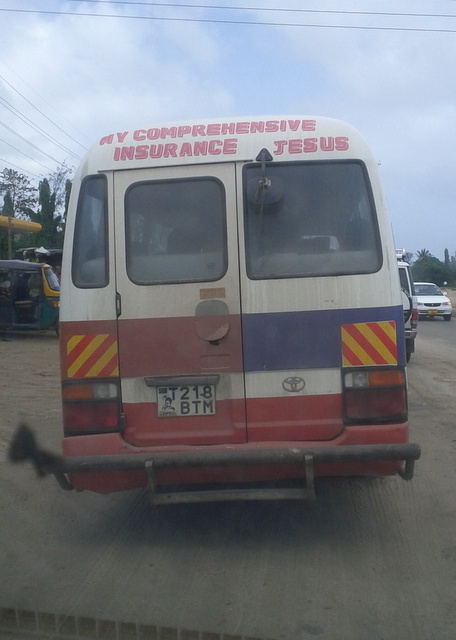 When will Tanzanians stop seeing Jesus as a good luck charm? As a talisman that will protect them or give them what they want? As just another spirit to appease? As much as they've got it wrong, so do I. At least their worldview is comprehensive; at least they automatically integrate the spiritual with the secular. 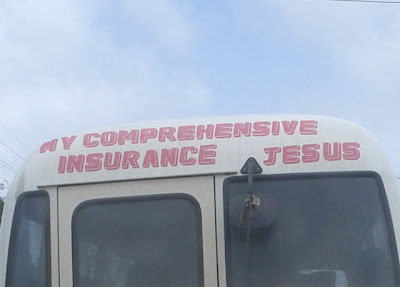 How often do I trust my insurance over my Jesus? There have been many times in Dar es Salaam when I have felt something crawling on my stomach. In alarm, I yank up my shirt, only to find the culprit was a large stream of sweat. On December 26th, I packed for our annual week up in the mountains. I sat in the kids' room on the floor, surrounded by stacks of clothes. I was not running a marathon; I was not sitting on a sunny beach; I was not working out in a gym. I was simply sitting on the floor, moving clothes around, under a ceiling fan. And I was covered in sweat. So you can see why this annual trip is so important to us. We drive 7 hours, up into the Usambara Mountains of Tanzania. There's no historic buildings to see; there's no family-friendly restaurants with playgrounds to visit; there's not even any big safari animals or ocean reefs to snorkel on. There's just cold. And really, that's all we want. We go with friends, we enjoy the mountain flowers and trees, we play lots of games and have lots of really great conversations. But mostly, we put on our hoodies and our socks and we sit around in the 60 degree weather and talk about how cold we are. It's delicious. I think the highlight of the week for the kids was that I actually allowed them to wear pajamas to bed. This is what the girls did: Sit around for hours after breakfast, talking. This is what the boys did: Play games all day, every day. 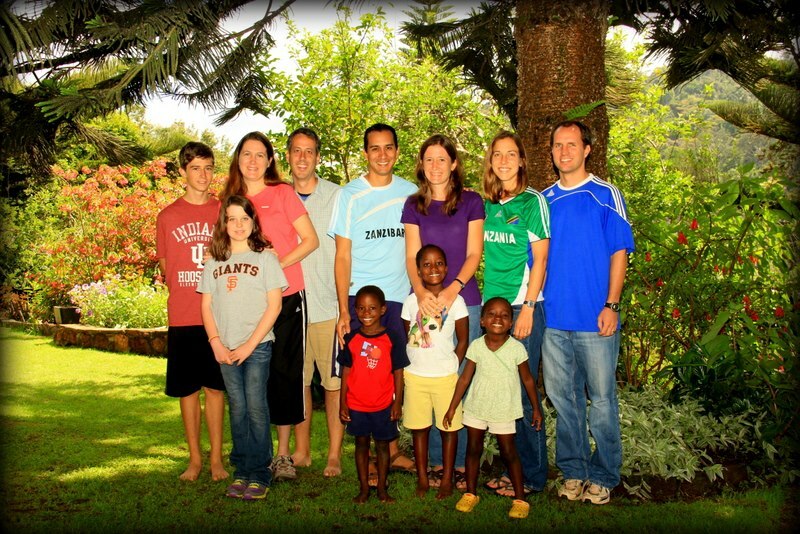 Our mission prayer group/Bible study group.....and really, our family away from home. So, so thankful for these guys.